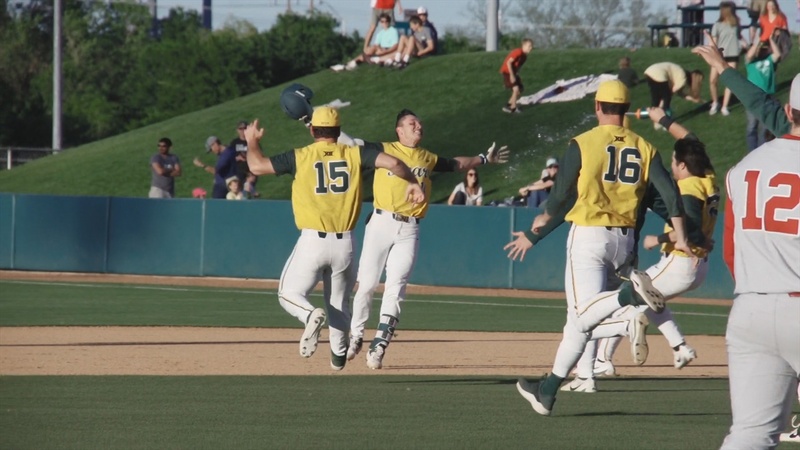 *This is Baylor’s fifth walk-off win of the season. *The Bears improved to 3-1 in extra-inning ballgames this year. *The 12-inning game was Baylor’s longest conference game since April 11, 2015 against Texas Tech, a 3-2 loss in Lubbock. *Baylor clinched its first season-series victory over Oklahoma under fourth-year head coach Steve Rodriguez. *The Bears are improve to 51-46 all-time against OU and 6-8 under Rodriguez. BU has taken three of the last five matchups with the Sooners. *The Bears are now 15-5 when scoring first this year. *The Bears tallied double-digit hits for the 21st time this season and fifth time in their last six games. *Baylor outhit its opponent for the 28th time this season and seventh consecutive time. The Bears have outhit their opponent in each of their 24 victories in 2019. *116 of Baylor’s 238 total runs in 2019 have come with two outs, including all three in today’s ballgame. *Davis Wendzel has a 15-game on-base streak and a six-game hitting streak. *Cole Haring has an eight-game on-base streak. *Richard Cunningham extended his hit streak to six games with his 12th multi-hit game of the year. *Andy Thomas extended his hit streak to six games. *Shea Langeliers tallied his eighth multi-hit game of 2019, going 3-for-5. *Langeliers recorded his ninth caught stealing of the season. *Blake Helton made his first career start, going 3.1 innings with two punchouts in a no-decision. *Ryan Leckich made his team-leading 19th appearance of the season. *Kyle Hill made his 18th appearance of the season, working a season-high three innings in relief. *Hill struck out two batters in his outing, moving him into fifth place on Baylor’s career strikeouts in relief leaderboard (126). Hill is currently fourth on BU’s all-time appearances leaderboard (88) and sixth on the all-time relief appearances chart (77). *Logan Freeman made his Baylor debut, coming on in relief and recording his first career strikeout as a Bear. *Kyle Harper made his first appearance since March 17 against Cal Poly when he entered as a pinch-hitter. 7 – Four Bears relievers combined for seven scoreless innings out of the bullpen (Logan Freeman, Ryan Leckich, Luke Boyd and Kyle Hill).
" The biggest thing is when you can have really good at-bats with guys in scoring position, you find a way to get on base, you execute, you have a pitching staff that’s doing what they’re doing, and at the same time you play great defense, the biggest thing is that you may not win it, but the key is just don’t lose the game. Don’t make some foolish mistakes that are going to cost you a game. Sometimes, we’ve done that. But right now, we’re playing really well, and I’m really happy with what our guys are doing.